Hillhouse’s Jada Boyd crosses the finish line to win the fourth heat of the 600 meters in the Class M indoor track and field championship Saturday in New Haven. Boyd won the finals with a time of 1:36.98. NEW HAVEN — While the Hillhouse boys literally ran away with the team title in the CIAC Class M indoor track and field championships at Floyd Little Athletic Center, it took a win in the final event by Hillhouse to claim the girls title after trailing Weston most of the meet on Saturday. Deshaune Poole won the 55 hurdles (7.74 seconds), 300 (35.35) and ran a leg of the team’s win in the 4×400 (3:28.29, meet record) and Neal Eley won the 55 (6.53), high jump (6 feet) and long jump (22-3.75) to lead Hillhouse to the boys team title with 87 points. Suffield was second with 56 points and Weston third with 41, followed by Stonington (38), Tolland (33) and Masuk (23). In the girls meet, with one event left, Hillhouse and Weston were tied at 66 going into the 4×400 relay. The Academics won the event in 4:03.13 and Weston was second, giving Hillhouse the team title with 76 points. Weston was second with 74 points, Sheehan third with 35, followed by St. Joseph (27), Berlin (25) and Ellington (24). Jada Boyd, who won the 600 (1:36.98) and the 300 (41.44), ran the first leg of the 4×400 and gave the Academics about a 10-meter lead to work with in the relay. Enyla Williams, De’Janay Davis, and Nyimah Ambrose completed the final three legs for the win and meet title. “Winning the title and contributing to the team feels great,” Boyd said. “It’s always great to win a state championship. We just go out and have fun. The Hillhouse boys won their fifth straight title, while it was the second straight for the girls. “The ultimate goal is to always win both the boys and girls team titles,” Hillhouse coach Gary Moore said. “I don’t feel right when one team wins and the other doesn’t. When that happens you have one team excited about winning and then there is the sadness and disappointment of the team that doesn’t win. In the boys competition, Poole was enjoying himself and the Academics’ successful day. “I’m definitely having a good time,” Poole said. “I had fun competing today, I just love competing. What’s been working for me is my strong finishes. Coach Moore has worked a lot with me to improve my finishes. In other events, Hillhouse freshman Gary Moore Jr., coach Moore’s son, was second in the shot put (48-3.5) behind Stonington’s (48-4). Hillhouse’s Talib McBride was second in the 600 (1:25.42) behind Suffield’s Jared Sharp (1:24.73). Lewis Mills’ Aidan O’Connor won the pole vault, clearing 14 feet and Nicholas Constantini of Foran was second (13-6). Michael Toppin of Lyman Hall finished second to Poole in both the long jump (20-10.25) and 300 (35.77). Caleb Tondora of Foran was second in the high jump (5-10). Suffield’s Nick Sinofsky (4:29.49) and Kyle Englander (4:29.81) went 1-2 in the 1600. Englander was second in the 3200 behind Tolland’s Alec Sauter (9:41.75). Tolland had four of the top fivie and six of the top 11 finishers in the 3200. Englander, Sinofsky and Sharp teamed with Cam Miller to win the 4×800 for Suffield. 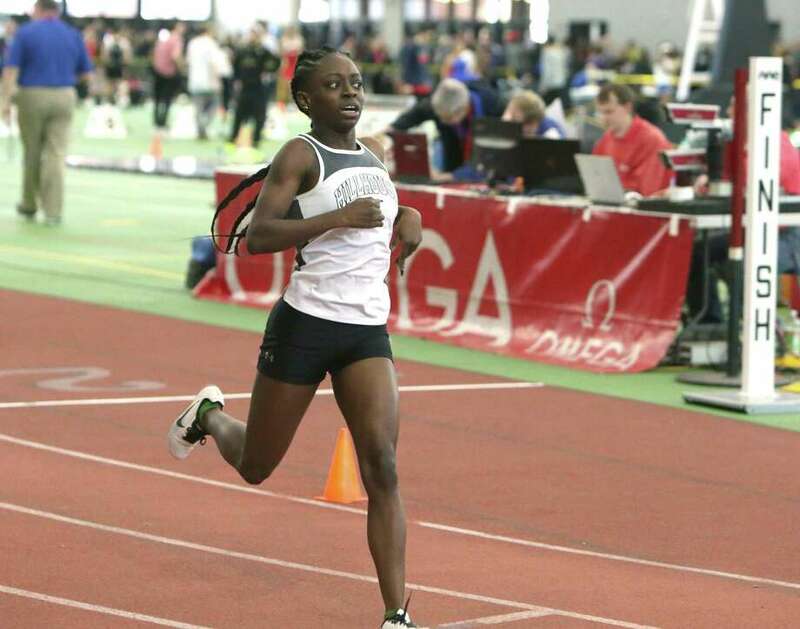 In the girls meet, Ayesha Nelson contributed to the Hillhouse title with wins in the 55 (7.31), 55 hurdles (8.48) and ran a leg of the winning sprint medley relay (4:19.11). One of the standouts for Weston was Elise Russell who dominated the pole vault to get the win with a vault of 11 feet. Wolcott’s Kathryn Rodrigues won both the 1600 meters (5:12.75) and 3200 meters (11:24.60). Berlin’s Patricia Mroczkowski set the Class M indoor record, clearing 5-6.25. The previous record was 5-6, set in 2000. Sacred Heart Academy had an interesting event with three sisters competing in the 4×200 relay. Kayla Cameron, Aliya Cameron, Meaghan Cameron and Bianca Kave led Sacred Heart Academy to a fourth-place finish in 1:51.72. Kave was also sixth in the 55 (7.76) and Aliya Cameron was second in the long jump (17-0.5) and third in the 55 hurdles (8.86). Sacred Heart Academy finished seventh with 21 points. Others who had success include Olivia Johnson of St. Joseph who won the long jump (17-3.75), Kayla Clark of St. Joseph was second in the 55 hurdles (8.64), Kyra Connolly of Sheehan was second in the pole vault (9-0) and Johnae Jones of Career was second in the 300 (42.59). 55 Meter Dash: 1. Ayesha Nelson, Hillhouse, 7.31; 2. Noelle Konior, Berlin, 7.43; 3. Kisha Francois, East Haven, 7.47; 4. Mariella Schweitzer, Joel Barlow, 7.60; 5. Jocelyn Wirth, Jonathan Law, 7.69; 6. Bianca Kave, Sacred Heart, 7.76. 300: 1. Jada Boyd, Hillhouse, 41.44; 2. Johnae Jones, Career Magnet, 42.59; 3. Elle Moshier, Stratford, 42.90; 4. Avery Winters, Sheehan, 43.26; 5. Julia Mansfield, Sheehan, 43.52; 6. Emma Zaccagnini, Watertown, 43.68. 600: 1. Jada Boyd, Hillhouse, 1:36.98; 2. Julia Rosenberg, Weston, 1:38.80; 3. Olivia Dubuc, Sheehan, 1:40.23; 4. Sydney Dzenutis, Northwestern, 1:41.50; 5. Meaghan Cameron, Sacred Heart, 1:41.88; 6. Emma Zaccagnini, Watertown, 1:42.63. 1000: 1. Sydney Schultz, Ellington, 3:02.83; 2. Elizabeth Stockman, Rocky Hill, 3:03.95; 3. Ava Zielinski, Weston, 3:05.38; 4. Ava Graham, Bethel, 3:12.80; 5. Lindsey Orr, Stonington, 3:13.80; 6. Elisabeth Brown, Sheehan, 3:14.65. 1600: 1. Kathryn Rodrigues, Wolcott, 5:12.75; 2. Mie Axelsson, Weston, 5:17.55; 3. Jordan Malloy, Bacon Academ, 5:17.58; 4. Samantha Ruggiero, New Fairfiel, 5:31.67; 5. Peyton Bornstein, Tolland, 5:34.59; 6. Juliana Cancellieri, Berlin, 5:40.25. 3200: 1. Kathryn Rodrigues, Wolcott, 11:24.60; 2. Ava Graham, Bethel, 11:32.88; 3. Juliet Bussell, Brookfield, 11:34.52; 4. Hazel Hudson, New Fairfield, 11:34.72; 5. Elizabeth Stockman, Rocky Hill, 11:45.69; 6. Kayla Cohen, New Fairfield, 11:47.17. 55 Meter Hurdles: 1. Ayesha Nelson, Hillhouse, 8.48; 2. Kayla Clark, St. Joseph, 8.64; 3. Aliya Cameron, Sacred Heart, 8.86; 4. Mariella Schweitzer, Joel Barlow, 8.94; 5. Nia Christie, St. Joseph, J8.94; 6. Vida Harris, Hillhouse, 9.10. 4×200 Meter Relay: 1. Weston (Elise Russell, Lauren Bigelow, Nicole Sztachelski, Hannah Greene), 1:47.84; 2. Career Magnet (Shana Jackson, Sofia Soriano, Gabriela Soriano, Johnae Jones), 1:48.42; 3. Sheehan (Amanda Castaldi, Clarisse Aminawung, Avery Winters, Julia Mansfield), 1:48.79; 4. Sacred Heart Academy (Bianca Kave, Aliya Cameron, Kayla Cameron, Meaghan Cameron), 1:51.72; 5. Hillhouse (Le’andra Allen Miller, Vida Harris, Amari Jones, Xzavea Bradley Glover), 1:52.42; 6. Stratford (Chi-Chi Anekwe, Kelly Goddard, Ava Buckmir, Elle Moshier), 1:53.32. 4×400 Meter Relay: 1. Hillhouse (Jada Boyd, Enyla Williams, De’Janay Davis, Nyimah Ambrose), 4:03.13; 2. Weston (Nicole Sztachelski, Julia Rosenberg, Lauren Bigelow, Ava Zielinski), 4:05.71; 3. Sheehan (Olivia Dubuc, Clarisse Aminawung, Avery Winters, Julia Mansfield), 4:13.55; 4. Career Magnet (Sofia Soriano, Gabriela Soriano, Shana Jackson, Johnae Jones), 4:14.69; 5. Ellington (Clara Mattson, Madison Holden, Ella Moser, Sydney Schultz), 4:16.34; 6. Watertown (Emily Gursky, Kaitlynn Thrall, Malina LaCapra, Emma Zaccagnini), 4:22.69. 4×800 Meter Relay: 1. Weston (Mie Axelsson, Natalie Haythorn, Kathleen Saussy, Michelle Gutowski), 9:55.41; 2. Stonington (Emma Small, Jessica Detwiler, Megan Detwiler, Lindsey Orr), 9:56.86; 3. Tolland (Peyton Bornstein, Calista Mayer, Isabelle McNamee, Kaitlyn Bedard), 10:03.98; 4. Ellington (Kathryn Bonanno, Caroline Minich, Kaitlyn Mead, Clara Mattson), 10:20.63; 5. Berlin (Alexa Monroe, Madison Monroe, Gabrielle Foster, Taylor Desmarais), 10:25.81; 6. Lauralton Hall (Abigail Baisley, Charlotte Costikyan, Rachel Wywoda, Mary Feeney), 10:29.39. 1600 Sprint Medley: 1. Hillhouse (Ayesha Nelson, Le’andra Allen Miller, Nyimah Ambrose, De’Janay Davis), 4:19.11; 2. Ellington (Ella Moser, Clara Mattson, Madison Holden, Sydney Schultz), 4:19.78; 3. Weston (Elise Russell, Lauren Bigelow, Nicole Sztachelski, Michelle Gutowski), 4:21.21; 4. Berlin (Noelle Konior, Maxine Muscatello, Kylie Gentile, Megan Perrotta), 4:25.41; 5. Stonington (Kaleigh Bolduc, Vanessa Benjamin, Megan Detwiler, Jessica Detwiler), 4:33.34; 6. Sheehan (Allison Villano, Patrice Mansfield, Clarisse Aminawung, Elisabeth Brown), 4:39.11. High Jump: 1. Patricia Mroczkowski, Berlin, 5-06.25#; 2. Tianna St. Louis, Tolland, 5-04; 3. Hannah Greene, Weston, 5-02; 4. Nia Christie, St. Joseph, J5-02; 5. Kayla Clark, St. Joseph, J5-02; 6. Vassa Rezvaya, Bethel, 5-00. Pole Vault: 1. Elise Russell, Weston, 11-00; 2. Kyra Connolly, Sheehan, 9-00; 3. Kelsey DeJesus, Watertown, J9-00; 4. Keegan Donohue, Stonington, 8-06; 5. Evelyn Miano, Weston, J8-06; 6. Erin Brennan, Sheehan, 8-00. Long Jump: 1. Olivia Johnson, St. Joseph, 17-03.75; 2. Aliya Cameron, Sacred Heart, 17-00.50; 3. Mariella Schweitzer, Joel Barlow, 16-09.25; 4. Kisha Francois, East Haven, 16-07; 5. Nyimah Ambrose, Hillhouse, 16-02.75; 6. Nia Christie, St. Joseph, 16-02. Shot Put: 1. Natalie Rolon-Issa, Bacon Academ, 39-05.25; 2. Sydney Mello, Lewis Mills, 39-02; 3. Jalynn McCown, Hillhouse, 38-03.50; 4. Leah Moore, Hillhouse, 37-10.50; 5. Emma Coggins, Suffield, 34-09.75; 6. Sharmaine Donaldson, Hillhouse, J34-09.75. 55 Meter Dash: 1. Neal Eley, Hillhouse, 6.53; 2. Conor Mahony, Masuk, 6.65; 3. Jaden Shirden, St. Joseph, 6.75; 4. Travon Brown, Ledyard, 6.76; 5. James Smith, Ledyard, J6.76; 6. Karl Bruce-Tagoe, St. Joseph, 6.78. 300: 1. Deshaune Poole, Hillhouse, 35.35; 2. Michael Toppin, Lyman Hall, 35.77; 3. Baruch Goodman, Weston, 36.26; 4. Ralphael Hawkins, Hillhouse, 36.79; 5. Preston Aldrich, Ellington, 36.98; 6. Conor Mahony, Masuk, 37.73. 600: 1. Jared Sharp, Suffield, 1:24.73; 2. Talib McBride, Hillhouse, 1:25.42; 3. Jeremy Saluzzi, Joel Barlow, 1:25.47; 4. Keith Caouette, Watertown, 1:26.97; 5. Jerold Lambert, New Fairfiel, 1:27.63; 6. Dale Thompson, Hillhouse, 1:27.91. 1000: 1. Rhys Hammond, Stonington, 2:31.80; 2. Marzio Mastroianni, Branford, 2:32.92; 3. Tobey Bill, Weston, 2:37.54; 4. Cam Miller, Suffield, 2:38.14; 5. Nate Davidson, Suffield, 2:39.04; 6. Jadon Parris, Brookfield, 2:39.43. 1600: 1. Nick Sinofsky, Suffield, 4:29.49; 2. Kyle Englander, Suffield, 4:29.81; 3. Jack Martin, Avon, 4:29.83; 4. Anthony Golino, New Fairfield, 4:32.30; 5. Jackson Cayward, Tolland, 4:32.34; 6. Andrew Janus, Bacon Academy, 4:38.03. 3200: 1. Alec Sauter, Tolland, 9:41.75; 2. Kyle Englander, Suffield, 9:44.33; 3. Killian McNamee, Tolland, 9:45.94; 4. Jacob Gerow, Tolland, 9:49.59; 5. Nathan Polangeli, Tolland, 9:55.22; 6. Nicholas Bendtsen, Wolcott, 10:00.48. 55 Meter Hurdles: 1. Deshaune Poole, Hillhouse, 7.74; 2. Aidan McShane, Masuk, 8.02; 3. Jared Lovell, Waterford, 8.04; 4. Myles Hall, St. Joseph, 8.05; 5. Adam Aponte, Bethel, 8.18; 6. Samuel Chicha, Weston, 8.20. 4×200 Meter Relay: 1. Ledyard (James Smith, Travon Brown, Jahmik Devone, Robbie Petriel), 1:34.64; 2. St. Joseph (Chris Coughlin, Myles Hall, Darren Warren, Jaden Shirden), 1:35.23; 3. Masuk (Steven Lee, Aidan McShane, Christopher Tillotson, Conor Mahony), 1:36.49; 4. Waterford (Marcus Lovell, Marcus Elliott, Kayvon Negahban, Christopher Smith), 1:37.81; 5. Jonathan Law (Alexander Lazar, Chris Wooten, Jackson Warters, Naheim Washington), 1:37.83; 6. Stonington (Suphasin Inthasit, Graham Johnstone, Martin Vernet, Benjamin Abely), 1:37.98. 4×400 Meter Relay: 1. Hillhouse (Talib McBride, Dale Thompson, Ralphael Hawkins, Deshaune Poole), 3:28.29#; 2. Weston (Tobey Bill, Aiden Kyle, John Cassol, Baruch Goodman), 3:30.17; 3. Ellington (Daniel Broding, Jack Olender, Nicholas Sivo, Preston Aldrich), 3:33.81; 4. Suffield (Brett Mockalis, Cam Miller, Nick Sinofsky, Jared Sharp), 3:34.28; 5. Lyman Hall (Jake Ranney, Andrew Horobin, Luke Horobin, Michael Toppin), 3:34.81; 6. Stonington (Ethan Allen-Fernandez, Chase Flynn, Joseph Hinckley, Rhys Hammond), 3:34.95. 4×800 Meter Relay: 1. Suffield (Cam Miller, Jared Sharp, Kyle Englander, Nick Sinofsky), 8:05.73#; 2. Tolland (Nathan Polangeli, Killian McNamee, Alec Sauter, Stephen Sutton), 8:16.22#; 3. Ellington (Joshua Stone, Nicholas Sivo, Daniel Broding, Jack Olender), 8:18.04; 4. Avon (Jack Martin, Tyler Hinrichs, Hari Patchigolla, Anish Rajamanickam), 8:24.95; 5. Branford (Nolan Scott, Andrew Betzig, Cheng Wu, Matthew Daley), 8:28.80; 6. Weston (Aiden Kyle, Kevin Crowley, Matthew Lagana, Neil Kaeslin), 8:36.05. 1600 Sprint Medley: 1. Stonington (Benjamin Abely, Martin Vernet, Joseph Hinckley, Rhys Hammond), 3:41.84; 2. Branford (Praneeth Ganedi, Carlos Macaay, Matthew Daley, Marzio Mastroianni), 3:46.32; 3. Hillhouse (To Rae Wright, Ralphael Hawkins, Dale Thompson, Talib McBride), 3:46.81; 4. Brookfield (David Henke, Seth Quattro, Schyler Parris, Jadon Parris), 3:51.18; 5. Watertown (Ian Judd, Joseph Skowronski, Keith Caouette, Johnathan Polletta), 3:51.96; 6. Ledyard (James Smith, Travon Brown, Jahmik Devone, Simon Reichert), 3:54.06. High Jump: 1. Neal Eley, Hillhouse, 6-00; 2. Jagger Petersen, Norwich Tech, 5-10; 2. Caleb Tondora, Foran, 5-10; 2. Samuel Chicha, Weston, 5-10; 5.Elliot Metviner, Weston, J5-10; 6. Jonathan Contaxis, Jonathan Law, J5-10. Pole Vault: 1. Aidan O’Connor, Lewis Mills, 14-00; 2. Nicholas Costantini, Foran, 13-06; 3. Joseph Hinckley, Stonington, J13-06; 4. Matthew Bigelow, Weston, 13-00; 5. Vaughn Campos, Weston, 12-06; 6. Oliver Zych, Weston, 12-00. Long Jump: 1. Neal Eley, Hillhouse, 22-03.75; 2. Michael Toppin, Lyman Hall, 20-10.25; 3. Jelani Johnson, Killingly, 20-07; 4. Samuel Chicha, Weston, 20-03.25; 5. Max Raha, Avon, 20-03; 6. Maxwell Luddy, Sheehan, 19-08.50. Shot Put: 1. Grayson DelGrosso, Stonington, 48-04; 2. Gary Moore Jr., Hillhouse, 48-03.50; 3. Cyle Martindale, Sheehan, 46-03.50; 4. Ethan Wilkie, Ellington, 45-01; 5. Devin Fitzpatrick, Prince Tech, 44-00.75; 6. Aaron Lange, Tolland, 42-06.75.